No, that’s not coming out. But wouldn’t it be a hoot? I’m contracted to act as “Developer at Large,” for Green Ronin, because is suits my role working on whatever needs to be done. Ork! 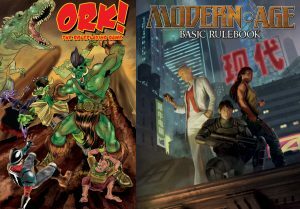 The Roleplaying Game (Second Edition!) and Modern AGE are on my mind, as varied elements of my job, with one thing in common: They’re both in production. Ork! got there in September, and Modern AGE entered that stage earlier this month. I developed both games, but their respective processes were very different. With Ork!, I followed in the steps of Jon Leitheusser, who did initial development, which in turn was based on the original game by Chris Pramas and Todd Miller. As Todd Miller is basically the ork god Krom, and all iterations of Ork! are intended to follow his mayhem-soaked vision, it was my job to make sure the project was properly . . . soaked. Spattered? Maybe that didn’t come out right. Modern AGE put me in a more traditional role, developing the book from start to finish. Chris Pramas had ideas for how to make a classless, contemporary Adventure Game Engine RPG. I carried those into an outline, selected writers, sent nagging emails to writers (they didn’t need them, I’m just insecure) developed multiple drafts, directed playtesting, and adjusted everything. It’s hard to find landmarks for a game designed for wide open, multi-genre play, so in the end I went with the systems and ideas I wanted to see combined, in a single package. What does “in production” mean? That the final drafts have been written, edited and put through a pre-layout proof. Using techniques I’ll call “sorcery,” (Note: I do not do layout) the layout person (often Hal) turns these drafts, which are .rtf files with markup Adobe software recognizes, into book-like PDF files. Meanwhile, artists submit sketches based on my art notes, and along with other folks, I approve them or request changes, until they end up as finished pieces. My art notes could be better, as they’re the aspect of the job I have the least experience with, but they’re coming along, and sketches are coming in. For Ork!, that means reviewing Dan Houser’s humorously brutal illustrations, like one of an prideful ork getting crushed by Krom! (This is basically how the game’s mechanics work, by the way.) For Modern AGE, I’m helping artists get the looks of iconic characters just right. Modern AGE uses a common set of characters, players and an “iconic GM” in illustrations and examples, so it’s important to me that consistent visuals follow. Once the finished art is added to the prototype layout we go over everything again, and check the files for technical issues too. At that point, as someone who is on the creative side of things, I assume the finished files float into the stars as wisps of fragrant mist (I also imagine the wisps are purple—maybe Blue Rose wisps are blue though) and by divine providence, materialize as books in warehouses. There are Ronin who apparently do work related to this; their tasks are a mystery to me. I must ask them what color the wisps are and also, why are they always annoyed with me for asking stupid questions? The upshot of this is that both games are on track for an early 2018 release. This is how they got there—at least, as far as my part of it goes. Now, onward. Forward. There are new projects in line. Modern Ork! is, sadly, not one of them, though who knows? The idea is starting to grow on me.